THPBlog: Green Diamond Resource Company planning clearcut THP near Patrick’s Point State Park. Green Diamond Resource Company planning clearcut THP near Patrick’s Point State Park. THP 1-13-051 HUM (BL 3900 14 THP) Green Diamond Resource Company, 92 acres; 65% clearcut, 18% no-harvest, 16% selection logging. McDonald Creek (HUM: T8N R1W Sec.2, 11; T9N R1W Sec.26, 35). Winter operations, moderate erosion hazard, steep slopes up to 65%, oversized units, herbicides, coho watershed, 1 spotted owl within 1.3mi, osprey within .25mi of unit a & b, Sonoma tree vole in unit a, northern red legged frog in unit c, trees up to 60” dbh. Estimated public comment deadline: 08/16/13. 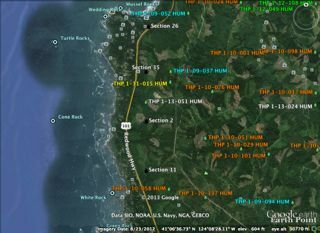 This THP is close to Patrick’s Point State Park and Highway 101 at an elevation of 300 to 550 feet. Green Diamond Resource Company is planning a feller buncher, shovel and cable clearcut logging operation within second growth redwood, spruce, Douglas fir and grand fir forests. The THP includes a 4.1 acre special treatment zone within units A & B to minimize the visual impacts to Highway 101. Units B & C are oversized, and there are steep streamside slopes within Unit C. All creeks and tributaries in the area flow directly into the Pacific Ocean. Coastal cutthroat trout were reported above unit A in Penn Creek, a northern red legged frog was seen in unit C, there was a Sonoma tree vole sighting in unit A, and Osprey were reported within .25mi of units A & B. More information is available on the THP Tracking Center website.